Daily components include Bible stories, health ventures, activities, creative crafts, and memory fun. 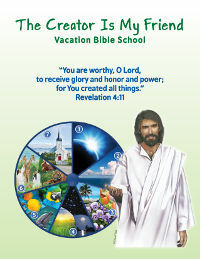 A complete program outline for a five-day, three-hour-a-day Vacation Bible School for ages four to twelve. A leader’s planning guide including a list of recommended staff positions with a complete ministry description for each position. Five fully-scripted theme talks and science object lessons, for opening and closing sessions each day. Children connect with Jesus, their Creator Friend, through learning a Creation-themed daily memory verse and experiencing a Creation-connected story about the life of Jesus. Children learn how to take care of their amazing bodies, created by God on the sixth day of Creation Week. Children get active exercise while discovering fascinating facts about each day of creation. Children unleash their own artistic creativity. Each craft will be a take-home reminder of the day of Creation studied that day. Three original Creation-themed, kid-friendly, worshipful songs in both print and audio format, with suggestions for their use at the beginning and end of each day’s program; plus suggestions for additional uplifting Creation-centered songs and song sources. A data CD with PowerPoint® slides for the three included songs and for an astronomy nature talk, plus copyable/customizable templates for registration forms, advertising materials and church publicity items, including a needs list for soliciting donated craft materials and other needed items. An audio CD with piano accompaniment for each of the three new songs, plus a recording of children actually singing the songs. Here is a sample of the music. The following items are not included in the VBS package, but they would make excellent, inexpensive gifts for the children who attend. 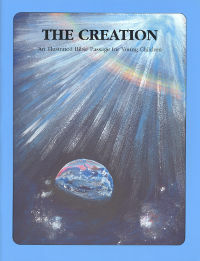 In the Beginning...: A small pictorial flip-chart on creation. And God Said...: A laminated poster on creation. The Seven Days of Creation: A visualized song on creation. 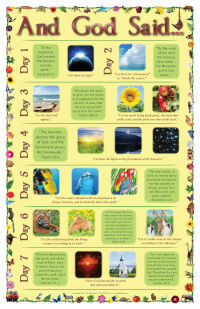 Creation Circle: Excellent visual aid for illustrating the seven days of creation. My church just finished "The Creator Is My Friend" program for VBS. I led the Creation Discovery Station.... I had a tremendous amount of fun with [it] and the children enjoyed it immensely while learning so much. All had an experience they will long remember. We couldn't have been more pleased with the materials. Thank you for giving us a great foundation for our VBS. Absolutely the best of the VBS programs we have used. Both kids and adults learned a lot. This is the first year that we can use a program comfortably from start to finish. Took all the stress out of VBS. We need another one next year.